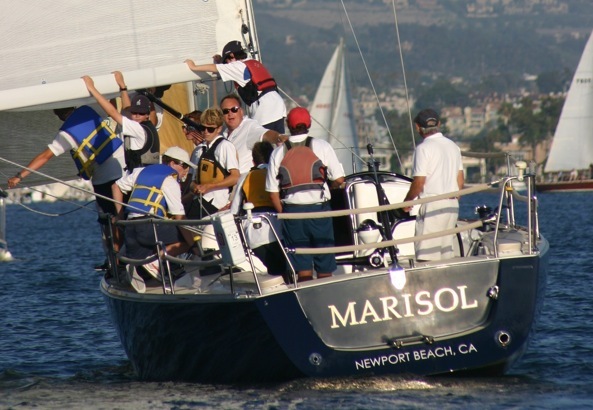 The Monday Crew of teen sailors in Sundownder Series action aboard the Marisol. You really don’t see many kids out on big boat races these days. Probably not the healthiest long-term trend for our sport, but there may be logical reasons for it. The junior sailing calendar is pretty full, and the top-tier sailing kids in our local high school and junior program really don’t have a lot of free time to race big boats. 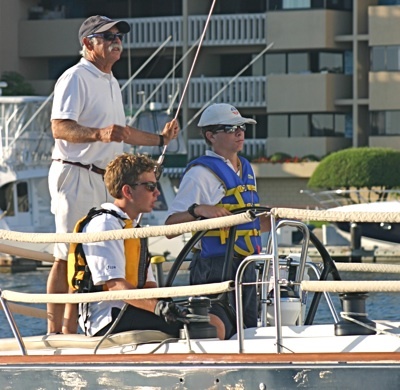 At the same time, owners of big boats (who do have the time and resources to mount a racing campaign) generally want to sail with their friends and established top-tier sailors; I don’t know many big-boat owners looking for “crazed” teenagers to come on board, teens who might be a distraction from their sailing goals. As much as we all accept this as the status quo, unfortunately, maybe we’re all missing the boat here. About a year ago, Seth Hall offered me an opportunity to race his J124 Mirasol on a few of his off nights when he was out of town. When I had these opportunities, I started bringing out a small group of local junior sailors (all young teenagers) so that they could have a night of big-boat racing. At the time, I didn’t give these periodic races much further thought. 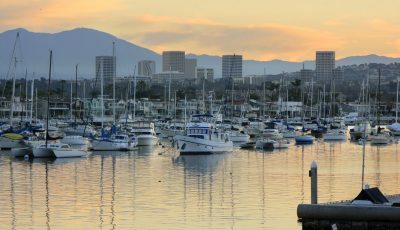 This spring I got another call from Seth; we discussed that it would be fun to put together a junior crew of young teenage sailors, and specifically a crew who would race Marisol in American Legion’s Sundowner Series every Monday night (a night he probably would not have raced regularly). Dave Ullman coaching Finn Dobkin (driving) and Michael Saborin (trimming). When the Sundowner series first kicked off in May, the Monday Crew was pretty rough (I’m glad Seth was out of town these first few weeks). Either Steve or I need to always be on the helm, and the other of us always needed to hover in the middle of cockpit in case anything went wrong. But because we sailed every week, the boys quickly refined their big-boat skills. Basics like grinding and releasing sheets off winches quickly became second nature. And as our big-boat sailing skills matured, our Monday night results steadily improved. It was fun seeing the boys wrestle with the trickier nuances of trimming and tacking across the bay. We also learned that there are local sailing professionals who were more than happy to spend a Monday night coaching the boys on the subtleties of racing this 41-foot sailboat. During the course of the summer, we took advantage of opportunities to bring out top local sailors like Mark Olson, Harry Pattison, Bruce Cooper, Tom Pollack, and last week Dave Ullman! 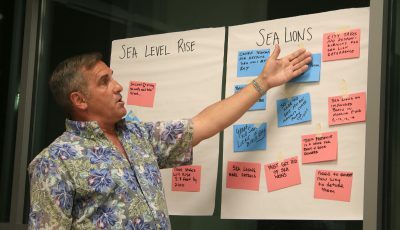 Each of these “experts” were incredibly gracious and open with their time, focusing the Monday Crew on a specific aspect of big-boat racing: sail trim, teamwork, tacking, gibing, communication, etc. 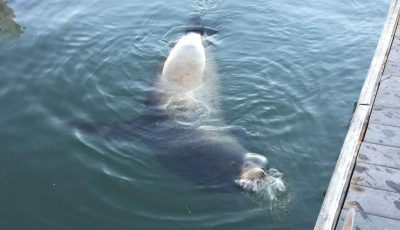 As each Monday went by, the boys’ skills improved, and the adults on board Marisol were increasingly pushed aside. By early August, the coaches were kept completely out of any hands-on role, as the boys had mastered all of the skills needed to run the boat in these races. In our race this last week, the adults never touched anything as Charlie Welsh (age 16) drove even during a crowded starting sequence. Seth joked that last week was the first time he’d ever been on his own boat where he hadn’t been allowed to touch anything. In recent weeks, we’ve enjoyed increasing competition from our sister ship in the race, Tim Harmon’s J124, Cirrus. Cirrus has brand-new sails and fresh bottom paint this summer, and the boys have learned she’s really fast. The boys have come to appreciate the meaning of a friendly rivalry with Tim and Cirrus, and are continually gunning now to make sure they find any way possible to stay ahead of her. Finally, one of the most important lessons for the Monday Crew is that crewing on a big boat isn’t just about the race. On Marisol, crew work starts before the boat leaves the dock; we cast off each night at 5:30 p.m., but every night there have been at least two or three boys who come down on their own quite a bit earlier to get the boat prepped for the race. And the boys also know that nobody leaves until everything is secure and put away for the night after the race. There are just a few races left in the Sundowner series, and I’m already regretting the approaching end. 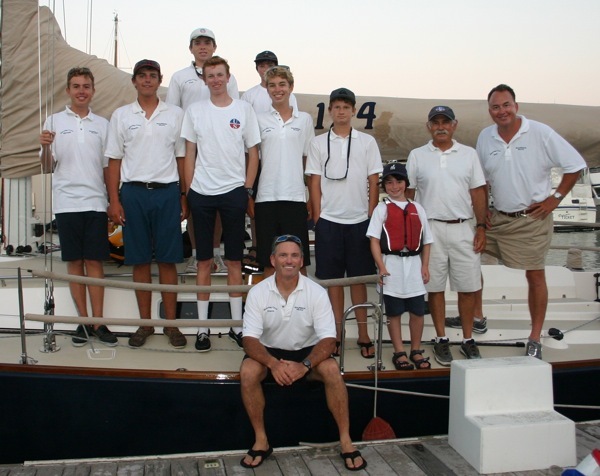 Each of the boys on board has grown so much this summer, and it’s clear on Mondays that the boys know that they are running the show – Marisol’s Monday Crew currently stands in first place in her class for the Sundownder Series. If we didn’t quite know what to expect when we put together this crew of teenagers, we now find ourselves wondering why we hadn’t done something like this years ago. Anyone looking to take a chance with a young, inexperienced but highly enthusiastic crew? They’re definitely out there, and maybe have far more to offer than we realized. The Monday Crew with Dave Ullman and Seth Hall.